PepsiCo aims to achieve this goal by collaborating with suppliers and partners, helping to increase consumer education, fostering cross-industry and public-private partnerships, and advocating for improved recycling infrastructure and regulatory reform, all of which are required to realize our ambition. 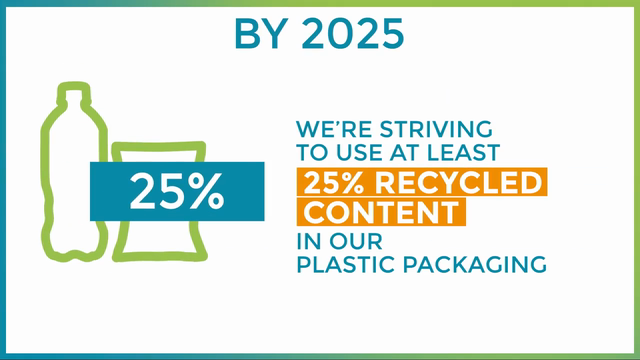 The goal includes an aim specific to PET (polyethylene terephthalate) beverage bottles to achieve 33% recycled PET content by 2025. "PepsiCo's sustainable plastics vision is to build a PepsiCo where plastics need never become waste. We intend to achieve that vision by reducing, recycling and reusing, and reinventing our plastic packaging – and leading global change through partnerships," commented Dr. Mehmood Khan, Vice Chairman and Chief Scientific Officer at PepsiCo. "Already, PepsiCo is one of the world's largest users of food-grade recycled PET. To further boost recycled content across all plastic packaging and drive progress towards a circular economy for plastics, it is vital to dramatically increase global waste collection and recycling rates through investment in recycling infrastructure and technology." PepsiCo's new goal builds on goals announced in 2016 under the company's Performance with Purpose 2025 Agenda. The 2025 Agenda included goals for PepsiCo to strive to design 100% of its packaging to be recyclable, compostable or biodegradable; to increase its use of recycled materials; to reduce the carbon impact of its packaging and, in partnership with the PepsiCo Foundation, to work to increase recycling rates. Earlier in October 2018, PepsiCo entered into a multi-year supply agreement with Loop Industries to incorporate Loop PET plastic, which is 100 percent recycled material, into its product packaging by mid-2020. Loop's transformational chemical recycling technology allows for low value plastics to be diverted, recovered and recycled continuously into new, virgin-quality plastic. In September 2018, PepsiCo announced it would collaborate in the Global Plastic Action Partnership (GPAP), led by the World Economic Forum, which will work with stakeholders in coastal economies, including in South East Asia, to show how businesses, communities and governments can redesign their waste management systems to create a circular model. In July 2018, The PepsiCo Foundation and nonprofit, The Recycling Partnership, announced the launch of "All in on Recycling," the largest ever industry-wide residential recycling challenge to make it easier for 25 million families across the US to recycle. At the heart of PepsiCo is Performance with Purpose – our fundamental belief that the success of our company is inextricably linked to the sustainability of the world around us. We believe that continuously improving the products we sell, operating responsibly to protect our planet and empowering people around the world help PepsiCo run a successful global company that creates long-term value for society and our shareholders. For more information, visit www.pepsico.com. Statements in this communication that are "forward-looking statements" are based on currently available information, operating plans and projections about future events and trends. Terminology such as "aim," "anticipate," "believe," "drive," "estimate," "expect," "expressed confidence," "forecast," "future," "goal," "guidance," "intend," "may," "objective," "outlook," "plan," "position," "potential," "project," "seek," "should," "strategy," "target," "will" or similar statements or variations of such words and other similar expressions are intended to identify forward-looking statements, although not all forward looking statements contain such terms. Forward-looking statements inherently involve risks and uncertainties that could cause actual results to differ materially from those predicted in such forward looking statements. Such risks and uncertainties include, but are not limited to: changes in demand for PepsiCo's products, as a result of changes in consumer preferences or otherwise; changes in, or failure to comply with, applicable laws and regulations; imposition or proposed imposition of new or increased taxes aimed at PepsiCo's products; imposition of labeling or warning requirements on PepsiCo's products; changes in laws related to packaging and disposal of PepsiCo's products; PepsiCo's ability to compete effectively; political conditions, civil unrest or other developments and risks in the markets where PepsiCo's products are made, manufactured, distributed or sold; PepsiCo's ability to grow its business in developing and emerging markets; uncertain or unfavorable economic conditions in the countries in which PepsiCo operates; the ability to protect information systems against, or effectively respond to, a cybersecurity incident or other disruption; increased costs, disruption of supply or shortages of raw materials and other supplies; business disruptions; product contamination or tampering or issues or concerns with respect to product quality, safety and integrity; damage to PepsiCo's reputation or brand image; failure to successfully complete or integrate acquisitions and joint ventures into PepsiCo's existing operations or to complete or manage divestitures or refranchisings; changes in estimates and underlying assumptions regarding future performance that could result in an impairment charge; increase in income tax rates, changes in income tax laws or disagreements with tax authorities; failure to realize anticipated benefits from PepsiCo's productivity initiatives or global operating model; PepsiCo's ability to recruit, hire or retain key employees or a highly skilled and diverse workforce; loss of any key customer or disruption to the retail landscape, including rapid growth in hard discounters and the e-commerce channel; any downgrade or potential downgrade of PepsiCo's credit ratings; PepsiCo's ability to implement shared services or utilize information technology systems and networks effectively; fluctuations or other changes in exchange rates; climate change or water scarcity, or legal, regulatory or market measures to address climate change or water scarcity; failure to successfully negotiate collective bargaining agreements, or strikes or work stoppages; infringement of intellectual property rights; potential liabilities and costs from litigation, claims, legal or regulatory proceedings, inquiries or investigations; and other factors that may adversely affect the price of PepsiCo's publicly traded securities and financial performance. For additional information on these and other factors that could cause PepsiCo's actual results to materially differ from those set forth herein, please see PepsiCo's filings with the Securities and Exchange Commission, including its most recent annual report on Form 10-K and subsequent reports on Forms 10-Q and 8-K. Investors are cautioned not to place undue reliance on any such forward-looking statements, which speak only as of the date they are made. We undertake no obligation to update any forward-looking statement, whether as a result of new information, future events or otherwise.